I re-played this game out a couple of weeks ago, but have now just got a chance to type up a report. There are some changes in the OB, the reinforcement entry and the scenario specific rules. I will save more for my comments at the end. The OB I am using is pretty accurate, and covers the first 3-4 hours of the action. I have left out the other brigade (Tissot) in Foy's 9th Division and I have not included Bachelu's 5th Division (For the sticklers on accuracy: There is significant documentary evidence that only one of Foy's brigades was engaged in the fighting, most likely Tissot's, but figure availability made me use Jamin's Brigade. I have also recently found out that the 2e légere were probably transferred to Bachleu's Division on June 10 and the 3e ligne were substituted into the Bauduin's Brigade). 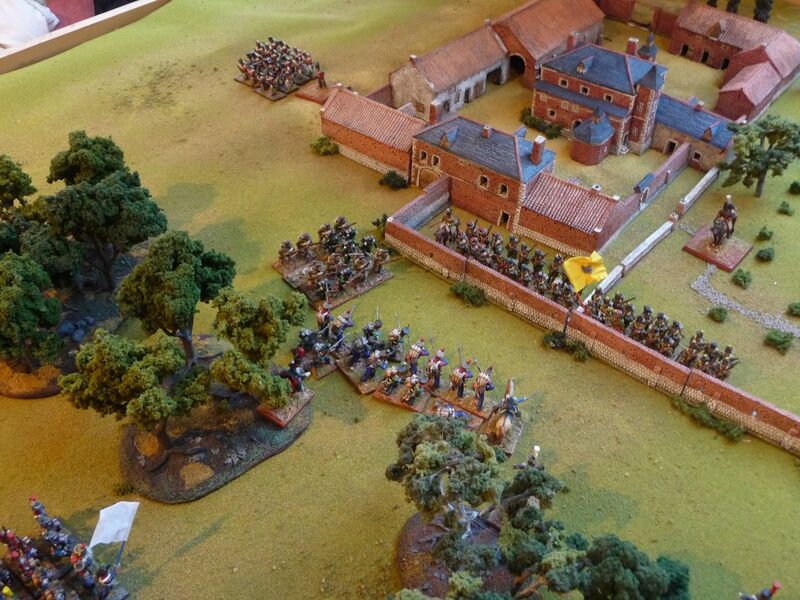 The British have two entrenched artillery units on the ridge overlooking the eastern approaches to the complex. They are not movable, but of course can prolong. I have used standard Lasalle ratings for all the French, I do not believe the 1,2,4e légère can be rated elite troops. I increased the SK value for the Nassau from the AB list. I have made the light companies of the allies irregular, I believe of course they would have fought as such, and the 1/2e légère are also irregular. They represent all the skirmishers sent forward in Baudin's brigade. The French sub-commander rating have been diced for, I have made MacDonnell a superior commander and Saltoun a good tactician and vigorous commander. Two engineering groups have been attached to the French. 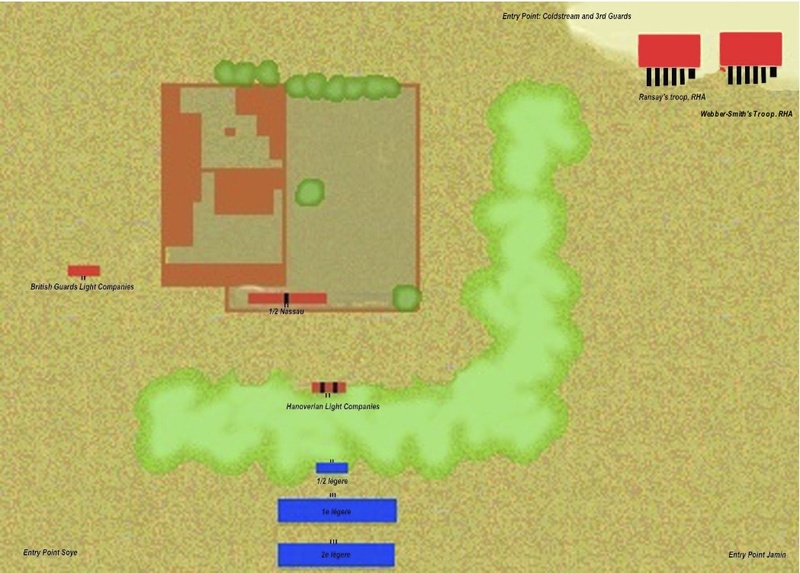 Soye's Brigade enters in Attack Column at the southwest corner, while Jamin's Brigade enters in Attack Column at the south east corner of the terrain. 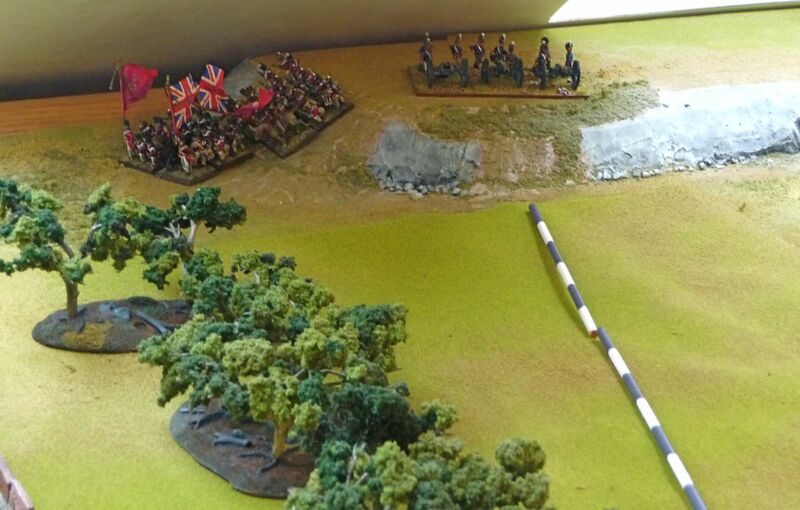 The 2/Coldstream and the 2/3rd Guards enter in March Column at the north corner of the terrain. Turn entry for the reinforcements is designed for this out of proportion complex. 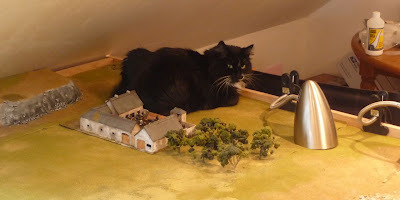 The terrain is 7x5ft and the central part is dominated by the Hovels 15mm model. I really can not use the concept of Lasalle BUA (1 BUA equals 3 BW) as laid out in the rule book because of the size of the model. 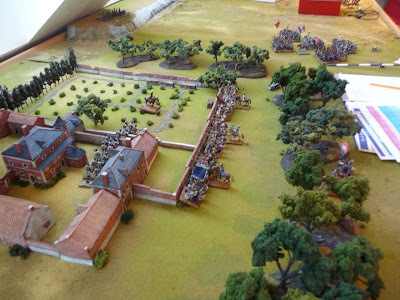 Because of this, I felt that it was reasonable that the maximum number of models that could occupy the walled Hougoumont complex at one time was essentially no more than a battalion (up to a 1000 men, so a 6 base unit is reasonable), that 2 battalions could occupy the formal gardens and that no more than a French brigade (6 battalions) could attack at one time. 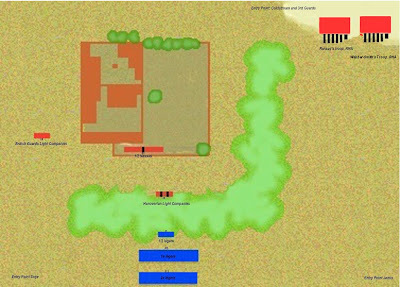 There is a zone of control (area which is barred to non attacking units) of 6 BW and that no more then 3 battalions can be in the ZOC on any one side of the Building-Formal Garden complex. The complex and the walls around the formal garden are impassable aside from the hedge row at the northern part of the formal garden.The gates and the walls can be destroyed as noted in the scenario specific rules. The walls are all hard cover. Movement within the complex and the formal garden is unrestricted and all units are in the complex are in the town deployed formation, but in the garden are regular formation. The 2 internal gates within the complex are not impediments. Movement out of the complex and through outer gates is in march formation. Woods around the complex are defined as rough terrain and soft cover. If using a smaller model, as defined by the Lasalle rulebook the building complex should be 1 BUA and the formal gardens 2 BUA. I would then half the turn entry for reinforcements ie. bring Soye's Brigade and 2nd Coldstream Guards in at Turn 8 rather then turn 16. Officers Tactics and Casualties, Irregular Units (Hanoverian, British elite companies, 1 French légère), Half Battalion Deployed (British Guards), Superior Commander (McDonnell), Irregular Units Recovering and Engineers are in play. In the Engineer demolition rule, I have added the ability to demolish the walls around the formal garden and the 3 outer gates. The wooden gates will be treated as the equivalent of a wooden bridge so an engineer may re-roll a failed attempt. The engineering bases are attached to specific units and can only carry out a demolition task. They do not utilise their assault enhancement. They are sent in once their parent unit is within 1 BW of their target. They are removed if the infantry unit to which they are attached is destroyed or when they carry out a demolition task. Although the walled garden is graded as regular terrain, the Allied troops graded as irregular do not suffer their firing penalty when within the garden. French units can contact the southern or western wall if they are charging through after an engineer has made a breach. 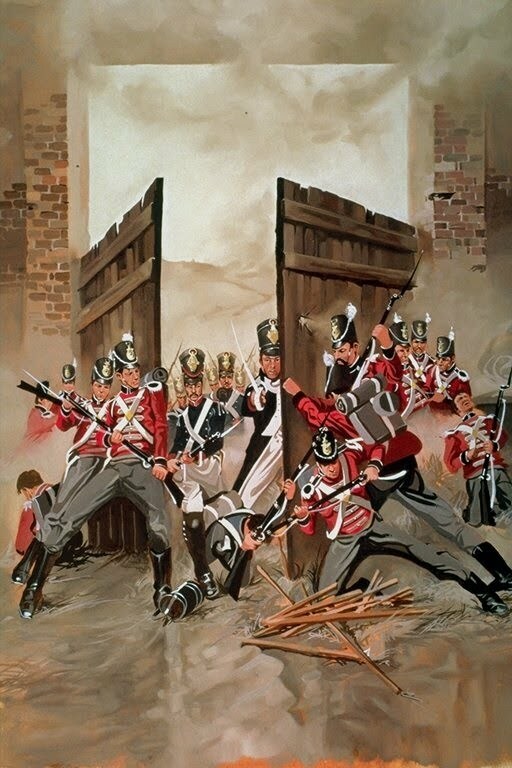 To assault a breach an unit has to be in Attack Column. French units can also attempt an escalade if they are in contact with a wall that has been abandoned by Allied troops (Allies are not in contact directly with the wall). 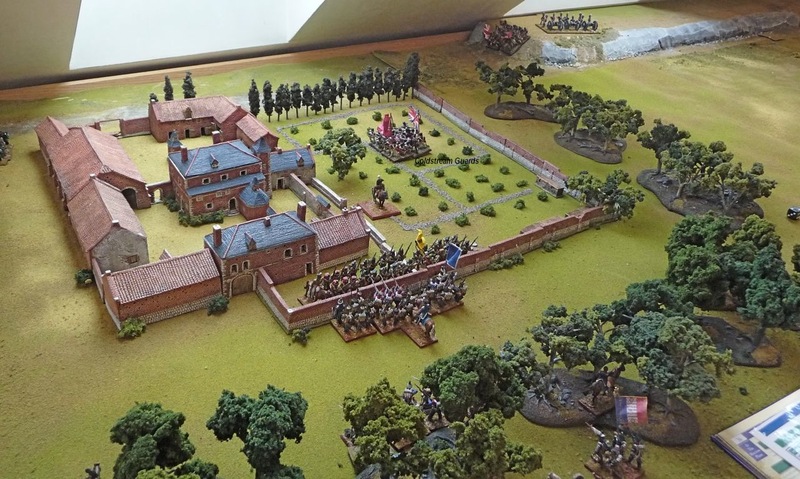 If the Allied forces fail to recontact the wall in their next turn, then the French can roll one D6 for ALL of the units that are in contact with the wall. If 3 units are in contact then a throw of 4 (5 or higher for 2 units and 6 or higher for 1 unit) or higher causes 1 unit to escalade the wall. Failure to pass the test causes 1 French unit to fall back (use the Fallback rules for combat). The game will last 48 turns or ends when one side fails it's Morale test. Use the regular method for determining the Morale test, but divide the turn by 3 (if at turn 45, then the total needs to be 16 for the 5 die to pass the test). There are no bonus turns. If the game ends and the British are still holding the Hougoumont complex and walled garden they have won. 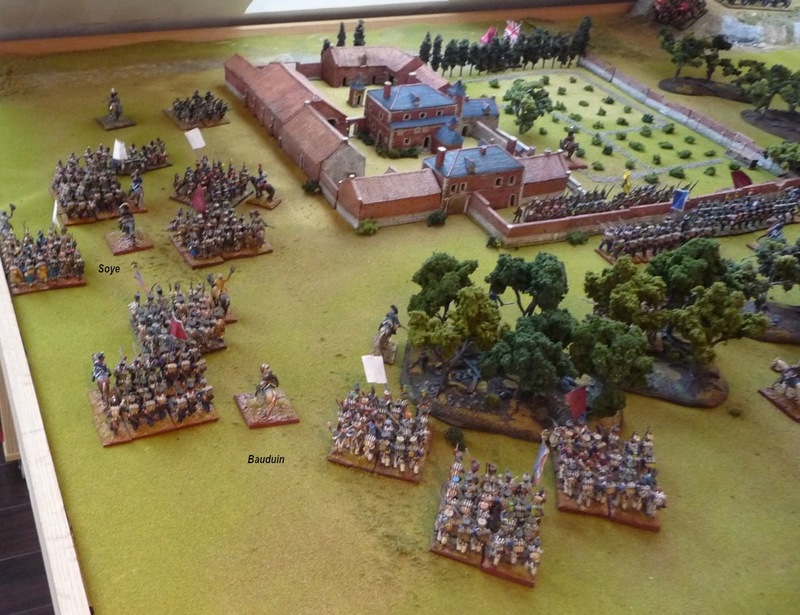 1/2e légère approach the wall, Hanoverians start their withdrawal. Prince Jerome splits Bauduin's bde in two with the 1e legere attacking to the west of the compound and the 2e legere to the south. The Guard's light companies form line with the Hanoverians advancing to their assistance. Both these units are irregular, thus suffering a firing penalty as they are not in rough terrain, neither can they charge. 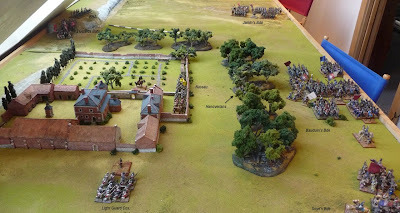 Lord Saltoun though is +1 for vigour and tactics so the Guards will have a significant advantage in combat. The 3/1e legere is repulsed and maneuvers to defend itself against an Hanoverian charge in to it's flanks. 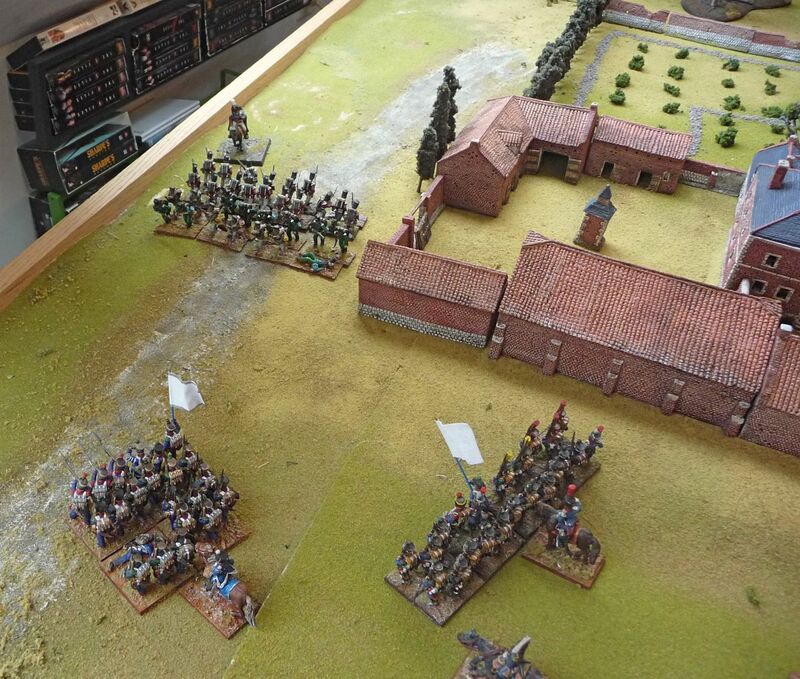 A series of skirmish actions take place and Soye's bde enters in turn 17. 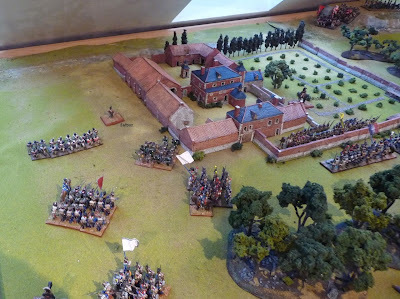 The British Guards and Hanoverians are now facing multiple French battalions and start to fallback, there retrogarde progress is slow. On turn 23, combat ensues between the Guards and the 3/2 legere, the Guards win decisively, but Saltoun is killed in the crossfire. Multiple French forces are firing at the Nassau. The Coldstream Guards enter the fray and advance into the garden to support the Nassau. Soye is advancing with 5 battalions to the north west, he has to be careful as there is a 6BW ZOC around Hougoumont. The light companies of the Guards and the Hanoverian start a brilliant withdrawal. Combats are fought and troops are fired on, French battalions fall, but their numbers are overwhelming. 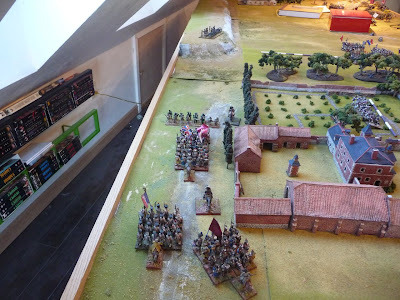 Meanwhile to the south the Nassau have held off the French attack to the south, but they have taken many casualties, the Coldstreamers advance is slow. The allies have been extremely fortunate with their dice throws (especially the Fallback throws) and seem have escaped from the French attack to the west. 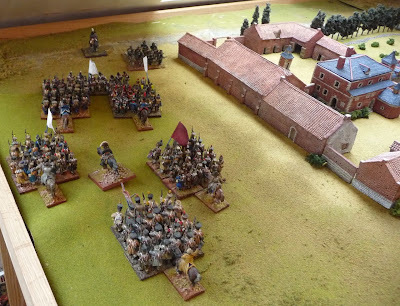 The light companies make ready to enter Hougoumont, while the Hanoverians cover their maneuvers. They also have been able to recovery some DISR as McDonnell as arrived to rally them. Unfortunately at turn 31, the Nassau fall and have to retreat. Prince Jerome has reordered his forces to the south and the Coldstreamers are about to undergo a sustained attack from 3 French battalions. McDonnell hurries back to support them. 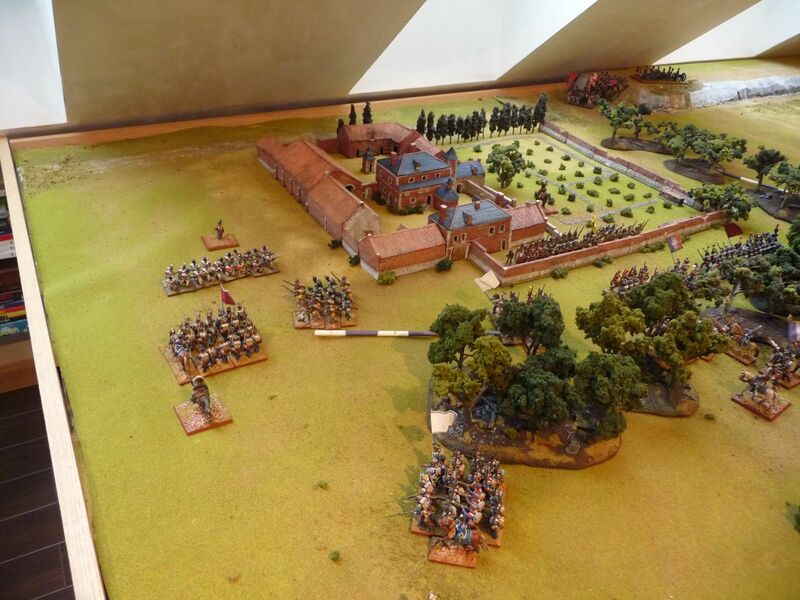 The 3rd Guards have been sent into to support the Allies at Hougoumont. The light companies now enter the compound and rush to the garden to assist the Coldstreamers, who are taking very heavy fire and are about to fail. 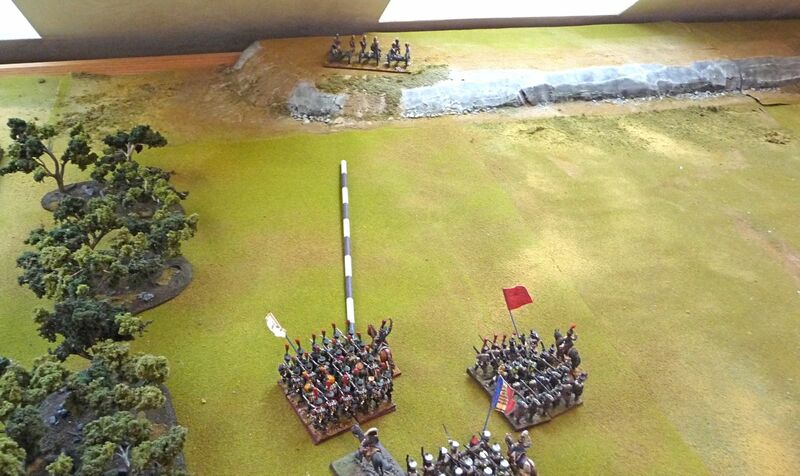 The 3rd Guards engage the French ligne in combat. The Allies pass their morale tests. ...........and they have held Hougomont. This was the best game I have played to date. I am absolutely amazed that the Lasalle rules played as well as they did with such an asymmetric battle. It was a lot of fun and although 48 turns seems like a lot, I spent around 5 hours at the game, two people could easily play it out in less then 4 hours. 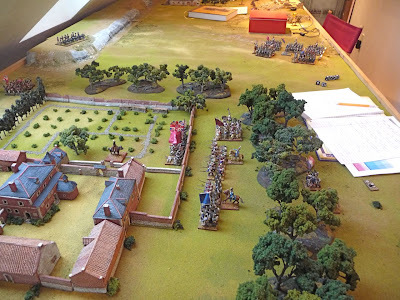 Tinkering with the rules is ok but as noted above, I did not anticipate what should happen if the Allies were not manning the walls, thus my invention of the Escalade rule. I planned the game to run only for about 3 hours into the battle, so I suspect that the British were saved by the clock. I also did not get a real chance to play Jamin's bde. Some adjustments may be needed with the reinforcement entry and I could have easily ran some more turns. 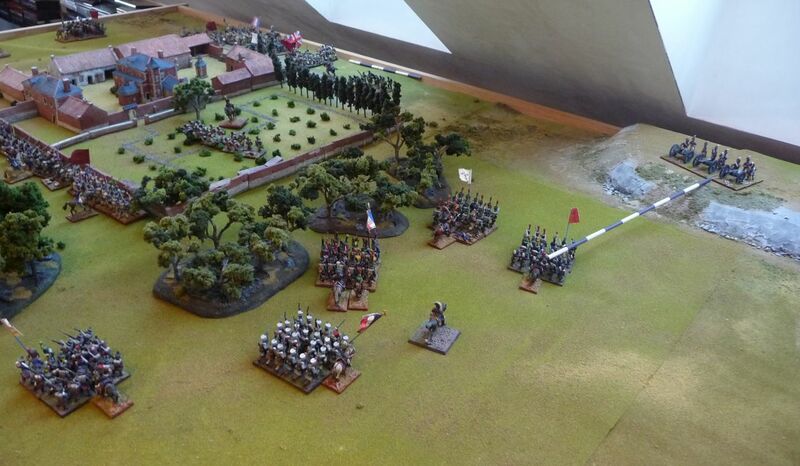 But that is enough for now, I am sure I will dust off the model in a few months and replay this great scenario. wow - what a great looking game and report, although as a French player I am disappointed by the results - a suitable excuse must be found! I'm surprise how good the 15mm buildings look with the 28mm figures. Thanks for taking both the time and effort to post such a grand battle report. I suspect I'll be reading it a few times! Thanks Miles, I surprised you could read the report, I had a horrible time with blogger crashing on me. A great AAR with a different timeline than the previous. It seems like you enjoy it very much! 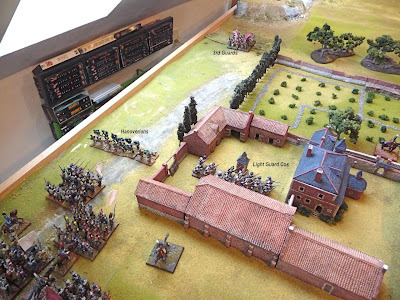 Excellent looking game, how do you recommend the adustments should be in board size for a game in 15mm? 5x 3 board??? 6x4? 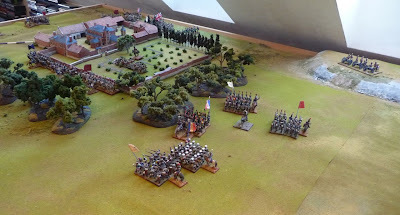 What was the bw for your game 2 inch stands at 50mm per BW? Very interesting read. 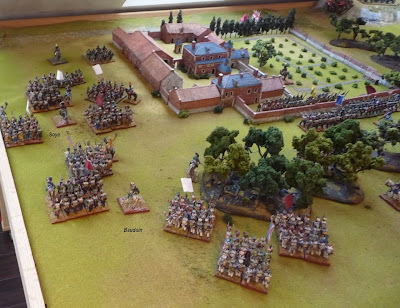 I have been trying to find some descriptions of Lasalle battles played out. Loved it. Thanks! Also, great models.